For damp proofing specialists in Cheltenham and other property care services contact our team at Timberwise. We provide services in the following areas: damp proofing, woodworm treatment, dry rot and basement waterproofing. We offer professional advice and treatments to all of our property care services and ensure that we give full customer satisfaction to all our customers. Timberwise Cheltenham are part of the Timberwise family. Timberwise have many high profile commercial customers in the Cheltenham area alongside the many satisfied homeowners who trust us to care for their homes. 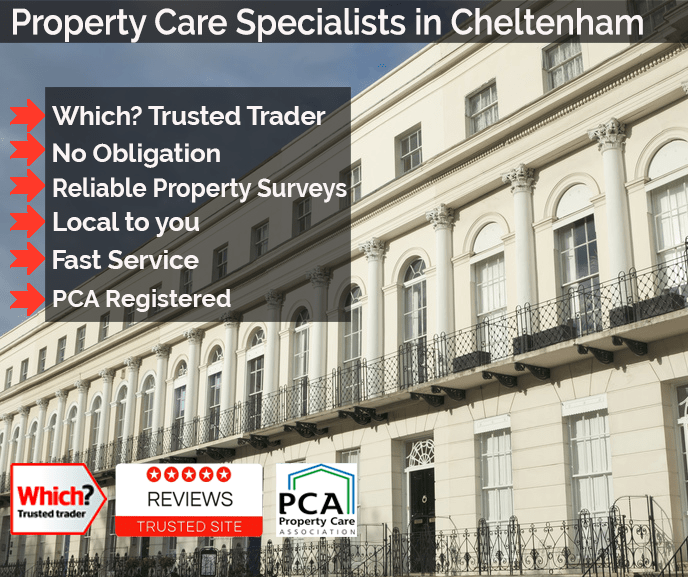 Our damp and timber treatments are provided across a number of areas in Cheltenham and we guarantee to deal with your property care problems once and for all. Having damp is a serious problem facing homeowners across Cheltenham. The large majority of rainfall usually falls in the months of June and July. When there are large periods of heavy rainfall, penetrating damp can occur due to damaged rainwater goods (gutters) not being able to evaporate rainwater out of the brick. If the moisture fails to evaporate the water will pass through the inner surface of the wall. Our highly skilled basement waterproofing team are experienced in changing your damp basement into an area you can add a cinema room or office space. Our Timberwise team in Cheltenham have a number waterproofing solutions to fit the needs of the customer such as using a cavity wall drainage membrane and basement and cellar tanking systems. For more information about basement waterproofing and the other property services, we provide at Timberwise then click here. Here at Timberwise, we like to showcase examples of work carried out by our teams. In one recent case, an insurance company contacted Timberwise Cheltenham to visit a property that showed signs of dampness and fungal decay in a bathroom. From the initial survey, it was apparent that the water leak had been on-going for some considerable period of time which had allowed problems to occur behind the scenes. Water was found in other parts of the property to as a direct result of the water ingress allowed by a faulty bath seal. All the wet rot infected timbers were replaced and precautionary treatments applied to the remaining timbers. To find out more about this wet rot project and for other examples of case studies click here. Timberwise provides property care service for all kinds of properties in a number areas across Cheltenham. We carry our property care services in Gloucester, Stroud, Swindon and Cirencester to name but a few places! Having property maintenance issues can be a real problem for homeowners and commercial property owners so at Timberwise we are here to help. You can contact our timber and damp specialists on 01242 639 472 or request a survey online by filling out the form.